*RECIPES DEPEND ON ACCURACY – Baking and cooking requires spot on measurements to produce the results intended. Our set provides the true amount every time to cook like a professional. 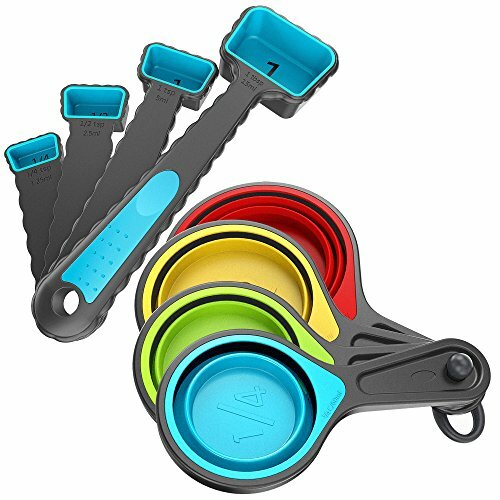 *EXTRA DURABLE AND BUILT TO LAST – Perfect set of 8 food grade collapsible measuring cups and spoons which are dishwasher safe. Our handles will never snap when handling dry or wet ingredients! *USER & SPACE FRIENDLY DESIGN – Collapsible cups do not take up much space in your kitchen and each cup can be superated to use individually. Size is clearly engraved so you always know how much you are adding! 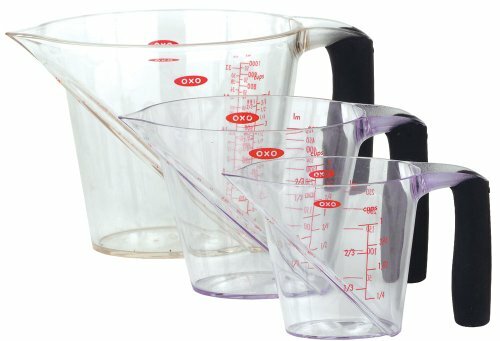 5 CUP SIZES – Measuring the right amount of milk, oil, water, syrups, pasta, rice, or nuts has never been easier. 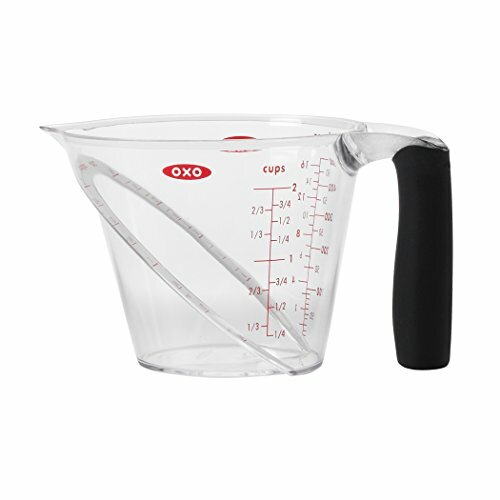 Get the accurate measurements for your delicious recipes with the help of the kitchen measuring cups. The four cups in the set feature a 1/8 cup, 1/4 cup, 1/3cup, 1/2cup, and 1cup. For your convenience, the UK metric equivalents for these measurements are 30ml, 60ml, 80ml, 125ml, and 250ml. 5 SPOON SIZES – Measuring spoons come in 5 sizes, 1/4TSP, 1/2TSP, 1TSP, 1/2TBSP, 1TBSP to help you measure your spices conveniently. The UK metric equivalents for these measurements are 1.25ml, 2.5ml, 5ml, 7.5ml, 15ml. Measuring spoons prevent your exotic spices being contaminated by dampness of your fingers. The shape of the spoons makes it easy to dig inside your small spice jars. 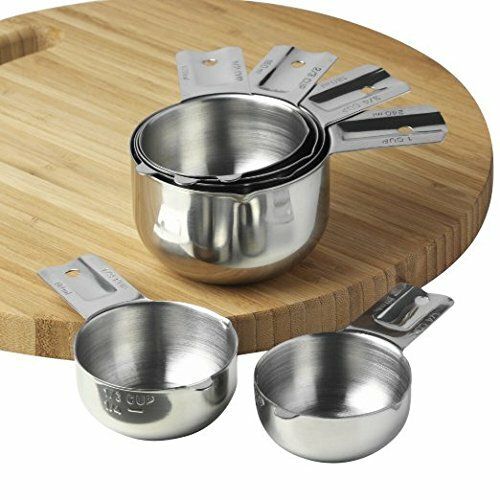 ELEGANT & ATTRACTIVE NESTED SET OF 6 STAINLESS STEEL MEASURING CUPS – 1/4, 1/3, 1/2, 2/3, 3/4, 1 Cup, also 1/8 measure embossed onto the 1/4 Cup. Easy to read engraved sizes showing both ‘cups’ and ‘mls’ makes baking a breeze that adds a touch of class to your kitchen instead of plastic. NARROW PROFILE WITH POURING LIP & FLAT BOTTOM – You won’t struggle to get into those low-profile containers or with liquid pouring down the edge and onto the floor. 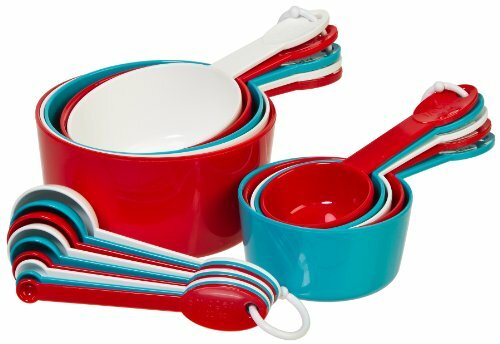 MATCHING MEASURING SET – Beautiful kitchen measuring tools with outstanding accuracy. 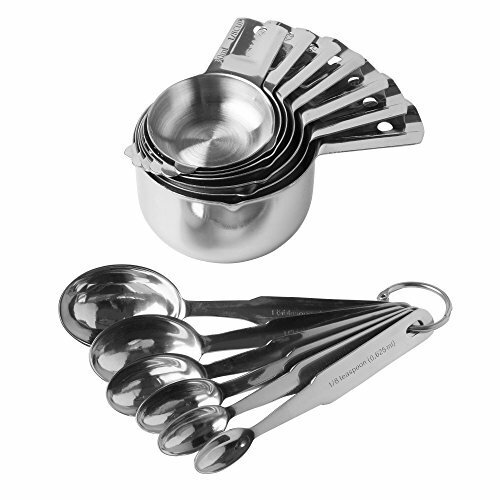 6 measuring cups and 6 matching measuring spoons crafted from polished, heavy-gauge 18/8 stainless steel to meet every measuring need. 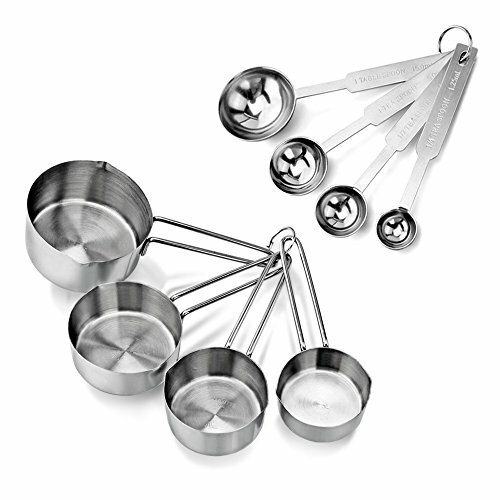 Confidently scoop and measure dry and wet ingredients for perfect cooking and baking. 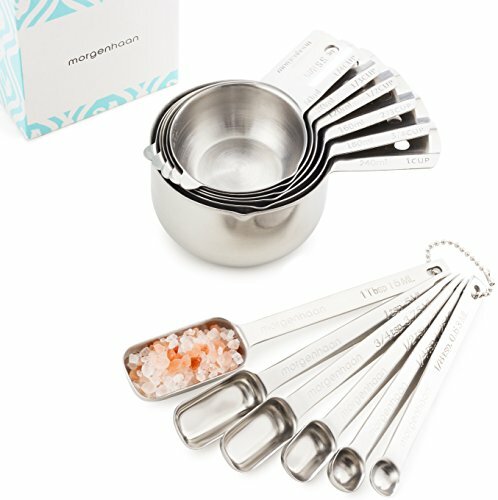 “FOREVER HANDLES” – Never feel the frustration of a failed measuring cup again with Morgenhaan. Forever Handles will never bend or break because the entire measuring cup and handle is made of one piece of strong metal. Fragile plastic handles and metal handles that are welded or bolted on simply don’t last. Food can’t get stuck between the cup and handle for easier cleanups. DESIGNED FOR DAILY USE – Enjoy years and years of use because Morgenhaan is built to last your lifetime and beyond. 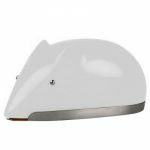 Equally good for restaurant kitchens as chefs will be greeted with the same professional craftsmanship and durability only typical of products designed for commercial use. Save money because this set will never need replacing. Truly impressive, heirloom-quality. 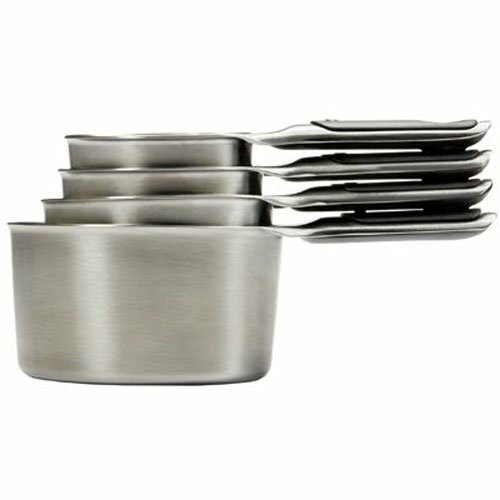 HIGH QUALITY DURABLE AND STURDY – These 6 cups and 5 spoons are Stainless Steel metal with a polished finish which means that will NEVER RUST! 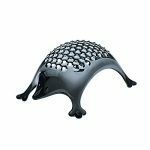 And can be placed in the dishwasher safely – Guaranteed not to break or bend under normal use. 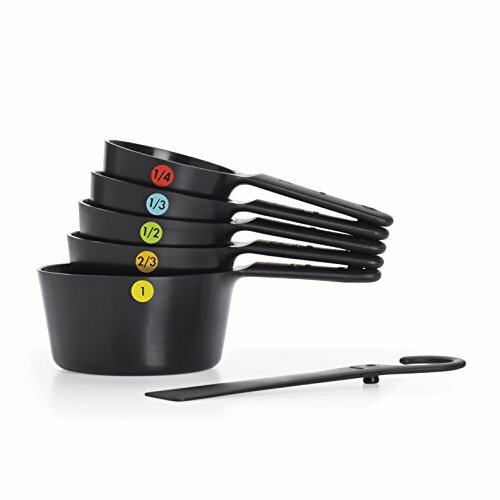 STACKEBLE AND ORGANIZED – The Cups and spoons each stacked in one bundle with a small – easily removable – ring which helps to keep it together as a set after a full day of baking or cooking plus nesting into each other beautifully, making them very compact and easy to storage. You can forget about missing one of the Cups or Spoons! 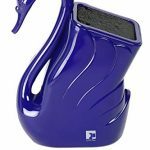 COMFORTABLE GRIP – The long soft Silicone handles provide an excellent easy non-slip grip and user comfort while backing and cocking, and won’t slip even with wet hands.